Ballymena United have confirmed Larne as the latest Irish League club to make an official approach for Jonathan McMurray. The striker, who was recently placed on the transfer list by United, has been linked with both Larne and Linfield in recent weeks. On Thursday, United used social media to inform supporters that “the club have received a letter from Linfield advising of their intention to approach Jonathan with a view to negotiating a contract with him”. 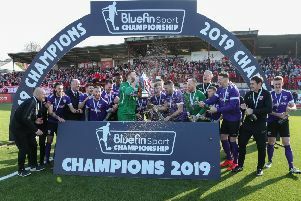 Now United have also revealed that there is concrete interest in the striker from outside the Danske Bank Premiership - with runaway Bluefin Sport Championship leaders Larne making an official approach. “We’ve been clear with our supporters, and with Jonathan, that any developments in relation to his future will be conducted openly and transparently,” said Ballymena United manager David Jeffrey in a club statement. “Therefore I can confirm that Larne have approached the club to request to speak to him to explore the possibility of agreeing terms.